If I’ve said it once, I’ve said it a million times; Americans love boxing movies. We don’t know why, we don’t care, we just want to watch them, whether they’re any good or not. And Hollywood wants to make them, that’s for sure, they keep pumping them out because we keep standing in line at the theatre. 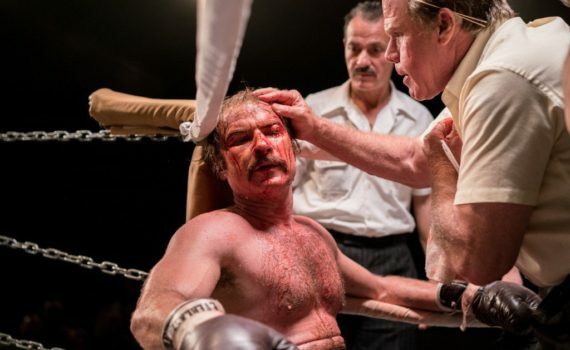 You’d think that the magic of boxing movie would wear out eventually, like the sport itself has, but if that’s true, that time definitely hasn’t come yet. We still want to see pugilists pugil, we want to see their drug addictions, and we want to see them win against all odds. It gives up hope, I think, somehow, even if that doesn’t make sense, and Chuck is no different. No better than all the rest, that’s for sure, but not really much worse either. Chuck Wepner, the Bayonne Bleeder, the real Rocky. Chuck grew up in New Jersey and learned how to fight early. Not that he was any good at it, but the kid could take a punch, and he never quit, even if he was bashing his head against a brick wall masquerading as a professional boxer. Chuck became known as the Bleeder because, well, he was always bleeding, always cut up so bad that he couldn’t see but refusing to throw in the towel. This tenacity led to his rise in the heavyweight ranks and ultimately to his chance to fight the great Muhammad Ali. But falls can come just as quickly as rises, and even a hit movie based on his career couldn’t keep Chuck from hitting rock bottom and facing the harsher realities of his life. I like boxing movies as much as the next guy, and I’m willing to give them the benefit of the doubt, but Chuck is more Hands of Stone and less Bleed for This, as far as the modern take on this aging genre goes. The most fascinating part of the story is how Chuck’s life connects to the Rocky movies, but even that turns depressing and lifeless, which, unfortunately, is a general theme in this film. There isn’t much boxing, but there’s a lot of cocaine, and there isn’t much heart, but there’s a lot of tears. The result is a downer of a redemption story that defies the genre in one way while holding on to it too tightly in others. The side cast didn’t help matters: Moss, Watts, Ron Perlman, Michael Rapaport, Jim Gaffigan. Watts is OK, but the rest sucked, and it took one hell of a performance from ol’ Liev to save the day. He took it all on his shoulders and turned a bad script into something palatable, if not exactly something award-worthy or even too recommendable.